The Janome DC6030 sewing machine. 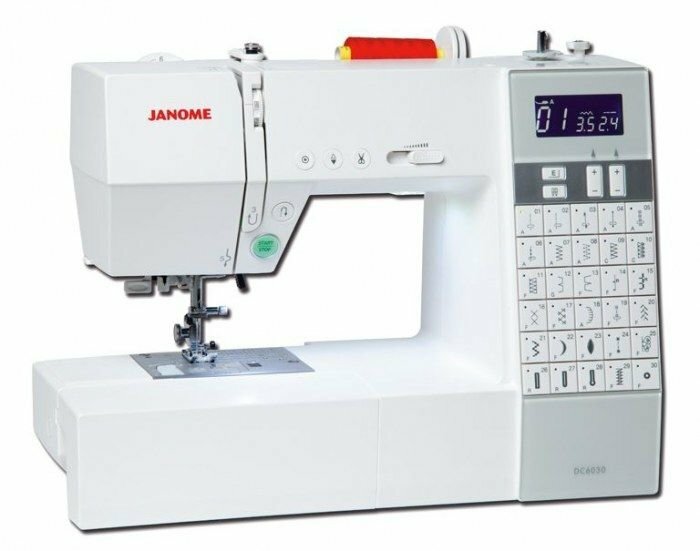 The Janome DC6030 is a really easy to use, fully computerised sewing machine that is packed with so many powerful features. Direct stitch selection, each stitch has its own dedicated stitch button. Each stitch button has a built-in light, which illuminates when selected. The LCD screen shows selected stitch, recommended foot, default stitch width and length, which you can change to suit your requirements. It offers a choice of 3 styles of one-step buttonholes and a great range of stitches for all types of sewing. Special features include pattern elongation of up to 5 times normal length; easy set bobbin system; a new style auto bobbin winder system; built-in needle threader; automatic thread cutter; needle up/down button; and an auto-lock stitch feature for precision locking off of stitches and patterns. It even has an automatic twin needle regulator and a start/stop button so you don’t have to use the foot control. The DC6030 comes complete with a large extension table and a hard cover.